Dixie L. Tucker, age 63, of Polk Center, Polk, PA, died on Friday morning, April 5, 2019 at UPMC Northwest in Seneca, PA. She was born in Titusville, PA on November 10, 1955, daughter of the late James K. and Doris E. (Flick) Tucker. 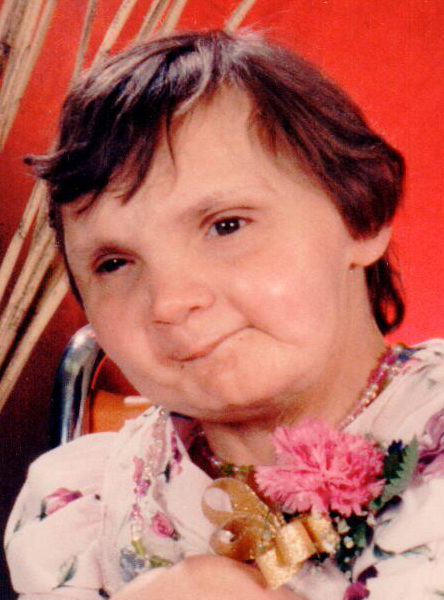 Dixie was well known amongst the staff and residents at Polk Center for her infectious giggle. She enjoyed flipping through catalogs and was happiest when spending time with her mother. Dixie is survived by many aunts and uncles: Don Flick and his wife Shirley of Beaver Falls, PA; Betty Bowen of Tionesta, PA; Virgil Flick and his wife Jane of Tionesta; Laura Flick of Tionesta; Ed Tucker of Warren, PA; and Larry Tucker of Greenville, PA. Several cousins also survive. In addition to her parents, she was preceded in death by her paternal grandparents, Harry K. and Edith I. Tucker. Her maternal grandparents, Frank E. and Ruth A. Flick. Three uncles and two aunts: Earl Bowen, Bill Flick, Helen and Tom Sweet, and Nancy Lauer. A memorial service will be held at 2:45 P.M. on Wednesday, April 24, 2019 at Meadowside Commons at Polk Center, 22 Meadow Lane, Polk, PA 16342. Burial will be alongside her parents in Riverside Cemetery, Tionesta. Arrangements are under the direction of the Norman J. Wimer Funeral Home of Tionesta. Memorial contributions may be made to Polk Center, P.O. Box 94, Polk, PA 16342 (please include “Dixie Tucker” on the memo line of your check).